Blue and white is classic decorating at its finest. Many things are trends that come and go, but blue and white has been "in" since the Chinese fully developed it in the 14th century. Beautiful groupings can be made from priceless antiques or your local import/export store. This large planter was a great find at my local antique store. I was about to pay (too much) when I noticed the crack (hairline) on the underside… SCORE!! Half price and the perfect home for my fern. Deals can be made if you’re not too picky. Speaking of planters, I found this gorgeous (heavy) wrought iron one at a local thrift shop. I painted it white and loaded on the blue and white. My plants seem very happy here on this sunny landing. I held out on you guys a bit with my “Feeling Cagey” post. Forgive me, but I was saving these beauties for our blue and white feature. This little birdie likes his new larger home with all the fancy grille work. I just love my cage in the kitchen! It stores all my blue and white china. Cups, saucers, plates, and bowls right on the counter within handy reach. This saves much needed cabinet space, and adds a decorative element. Doesn’t he look happy? Home and dry my friend. The birdcage isn’t the only grille work holding blue and white treasure. 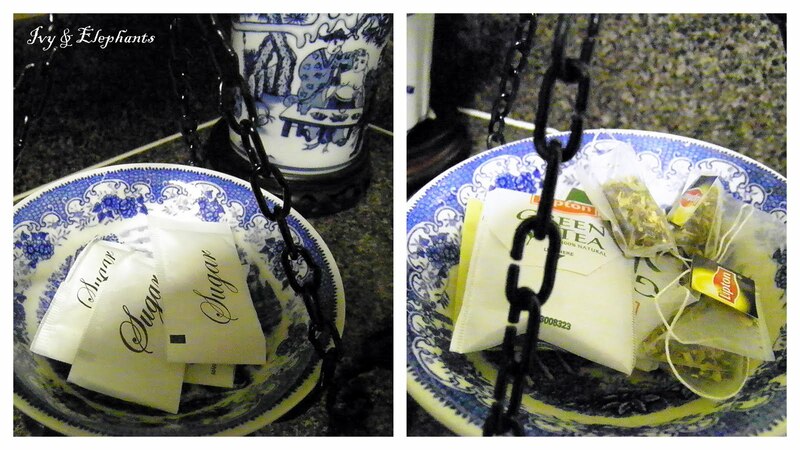 This scale holds sugar and tea at the ready. This huge cage is the feature in my dining room. I originally wanted to mount it on the wall in the niche, but it was too heavy and hung out too far. So I placed it on this little demilune table I found (for a song) and of course started fussing with it. See the Russian egg tassel? Peek inside, pretty porcelain and yummy jewels on the ground floor. TADA! Here she is in all her finery. 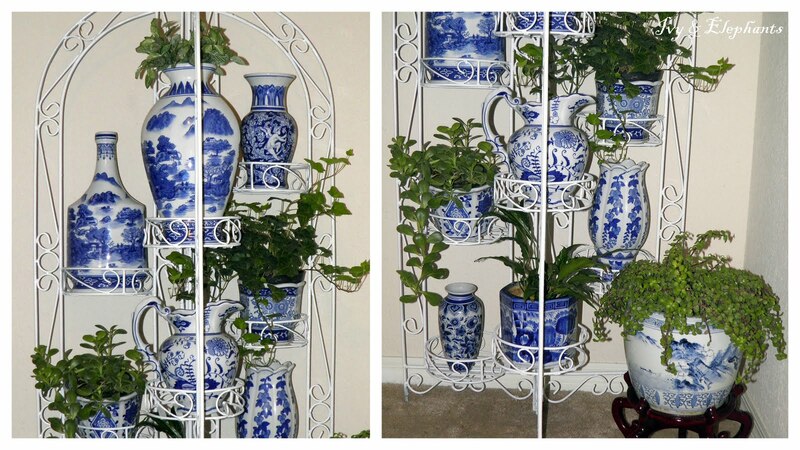 I added more blue and white plates and a platter to fill the niche. Oh! Do you spy that bargain planter? See why I had to have it. This is one of my favorite things and I had sooo much fun with it. We hope you’ve enjoyed hearing us sing the blues. What’s got you blue? Leave us a comment, we love hearing from you! I'm a fan of blue and white and love your collection! I love the blue and white. I had lots of it when I had my own home, but now that I got married have moved away from it. I wish I would have kept some of the pieces. Oh well someone else is now enjoying them. Atleast they went to a good home. Thanks for sharing. I look forward to seeing all of your decorating. Very inspiring. Oh I just love all of your blue and white and I too have a collection of it that I use around my home! One more reason I feel connected to you gals! :-) You have given me so many more great ideas of how to display mine! There is something so cheerful about blue and white...and yes, bargains can be had if you are not too picky...most of my stuff is just like that...perfect for me! Very nice blue and white which always looks so fresh and clean. Gorgeous photos! I'm loving that blue china; your birdcage vignette is beautiful. HOney your blues are gorgeous. Love, love, LOVE this blog! Hey guys, thanks for popping by my little blog. I am following you right back, well how could I not? your blog is to die for. I love love love the way you have displayed all your bits n pieces. The birdcage is my favourite and yes I am definately turning green with jealousy. How on earth do you find the time to atend to all the projects that you do? Painting the large white planter has made it look fab. I have such a large pile of projects now that this weekend I decided to put them all on the dinning room table and try to get them sorted. So happy to find you!! I love your blue and white series! 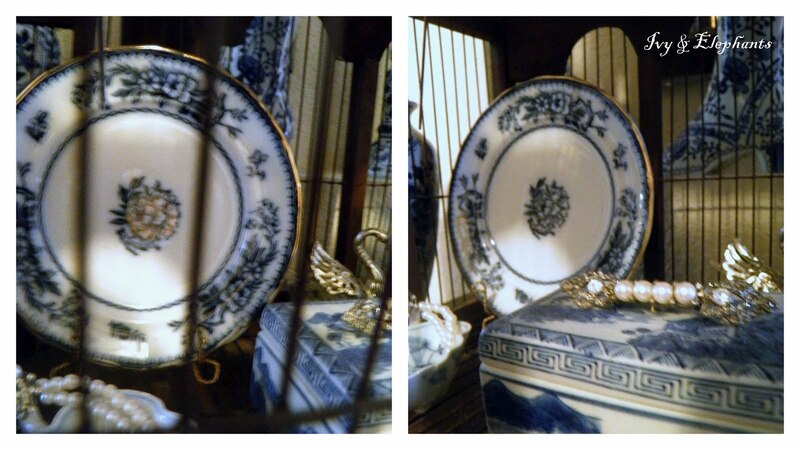 I have some pieces of blue and white porcelain in every room. Beautiful post and blog. I too, love blue and white. It is indeed timeless. I absolutely love your cages especially the large one and the one holding blues and whites in the kitchen. OMG, what a beautiful collection of blue and white you have. 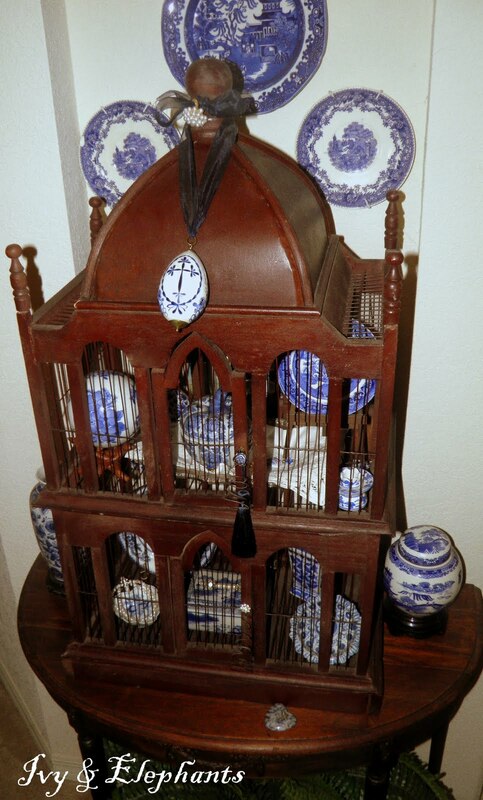 I just love the way you have displayed them too.... especially love the dishes displayed with the bird cage! Wonderful blog Patti! I really enjoyed Lady Sings The Blues (Great title!). You have some amazing pieces and beautifully displayed. Very nice photography too. I am a blue and white lover too :). I currently have some china in these colors stored away and after reading this post I feel inspired to take it out! Blue and white is my all time favorite. I love the creative use of the cage for storage of the dishes. Simply lovely. Yours is the most amazing collection of blue and white I have seen. Such a variety of ways to display it. Just so striking. Love the cage and hanging cups the best. Very origional! WOW! I've never seen anyone with such a wonderful blue collection.... I loved the CAGE. How clever. I just had to come back for a second look. Your collection of blue and white china is only surpassed by your amazing ability to display it. I love your displays. They are so creative an show your collection at it's best. Oh my, I am loving your blue & white in the birdcages!! How gorgeous!~ That one in your kitchen is just amazing. Thanks for linking it up! What a beautiful collection! I love your birdcage too. I have a couple in my house as well, including one just like the one on your kitchen counter. Great idea!!! I love you style! Where or where did you get that beautiful bird cage you placed on your kitchen counter top? Lovely display. Oh, I love it too. So many, hard to choose which is the prettiest! Oh, well, no need to pick...I like them ALL.